Syracuse ( or local ) is a city in, and the county seat of, Onondaga County, New York, United States. 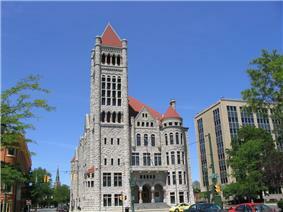 It is the largest U.S. city with the name "Syracuse", and is the fifth most populous city in the state of New York. At the 2000 census, the city population was 147,306, and its metropolitan area had a population of 732,117. 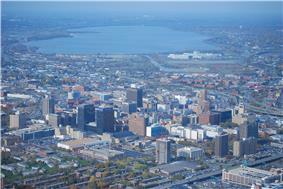 It is the economic and educational hub of Central New York, a region with over a million inhabitants. Syracuse is also well-provided with convention sites, with a downtown convention complex and, directly west of the city, the Empire Expo Center, which hosts the annual Great New York State Fair. Syracuse was named after the original Syracuse, (Siracusa in Italian) a city on the eastern coast of the Italian island of Sicily. 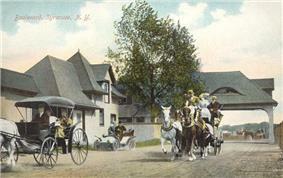 The Syracuse area was first seen by Europeans when French missionaries came to the area in the 1600s. At the invitation of the Onondaga Nation, one of the five constituent members of the Iroquois confederacy, a group of Jesuit priests, soldiers, and coureurs des bois (including Pierre Esprit Radisson) set up a mission, known as Saint Marie Among the Iroquois, or Ste. Marie de Gannent aha, on the northeast shore of Onondaga Lake. Jesuit missionaries visiting the Syracuse region in the mid 1600s reported salty brine springs around the southern end of "Salt Lake", known today as Onondaga Lake. The 1788 Treaty of Fort Stanwix, and the subsequent designation of the area by the state of New York as the Onondaga Salt Springs Reservation provided the basis for commercial salt production from the late 1700s through the early 1900s; brine from wells that tapped into halite(common salt) beds in the Salina shale near Tully, New York, 15 miles south of the city were developed in the 19th century. It is the north flowing brine from Tully that is the source of salt for the "salty springs" found along the shoreline of Onondaga lake. The rapid development of this industry in the 18th and 19th centuries led to the nicknaming of Syracuse as "The Salt City". The first Solvay Process Company plant in the United States, was erected on the southeastern shore of Onondaga lake in 1884 and the village was given the name Solvay, New York to commemorate its inventor, Ernest Solvay. In 1861, he developed the ammonia-soda process for the manufacture of soda ash (anhydrous sodium carbonate, a rare chemical called natrite, to distinguish it from natural natron of antiquity) from brine wells dug in the southern end of Tully valley (as a source of sodium chloride) and limestone (as a source of calcium carbonate). The process was an improvement over the earlier Leblanc process. The Syracuse Solvay plant was the incubator for a large chemical industry complex owned by Allied Signal in Syracuse, the result of which made Onondaga Lake the most polluted in the nation. The salt industry declined after the Civil War, but a new manufacturing industry arose in its place. Throughout the late 1800s and early 1900s, numerous businesses and stores were established, including the Franklin Automobile Company, which produced the first air-cooled engine in the world; the Century Motor Vehicle Company; and the Craftsman Workshops, the center of Gustav Stickley's handmade furniture empire. The Geneva Medical College was founded in 1834. It is now known as Upstate Medical University, the most prestigious medical college in the Syracuse area, one of only four in the State University of New York system, and one of only five medical schools in the state north of New York City. World War II sparked significant industrial expansion in the area: specialty steel, fasteners, custom machining. After the war, two of the Big Three automobile manufacturers (General Motors & Chrysler) had major operations in the area. Syracuse was headquarters for Carrier Corporation, Crouse-Hinds traffic signal manufacturing, and General Electric had its main television manufacturing plant at Electronics Parkway in Syracuse. The manufacturing industry in Syracuse began to falter in the 1970s. Many small businesses failed during this time, which contributed to an already increasing unemployment rate. Rockwell International moved their factory outside New York state. General Electric moved its television manufacturing operations to Suffolk, Virginia and later to Singapore. The Carrier Corporation moved its headquarters out of Syracuse and outsourced manufacturing to Asian locations. Nevertheless, although city population has declined since 1950, the Syracuse metropolitan area population has remained fairly stable, even growing by 2.5 percent since 1970. While this growth rate is greater than much of Upstate New York, it is far below the national average during that period. About 27 percent of Syracuse's land area is covered by 890,000 trees — a higher percentage than in Albany, Rochester or Buffalo. This is despite the Labor Day Storm of 1998, a derecho which destroyed approximately 30,000 trees. The sugar maple accounts for 14.2 percent of Syracuse's trees, followed by the Northern white cedar (9.8 percent) and the European buckthorn (6.8 percent). The most common street tree is the Norway maple (24.3 percent) followed by the honey locust (9.3 percent). The densest tree cover in Syracuse is in the two Valley neighborhoods, with 46.6 percent of their land covered by trees. The lowest tree cover percentage is found downtown, which consists of only 4.6 percent trees. Syracuse's main water source is Skaneateles Lake, one of the country's cleanest lakes, located 15 miles (24 kilometres) southwest of the city. Water from nearby Onondaga Lake is not drinkable due to industrial dumping that spanned many decades, leaving the lake heavily polluted. Incoming water is left unfiltered, and chlorine is added to prevent bacterial growth. For periods of drought, there is also a backup line which uses water from Lake Ontario. Onondaga Creek, a waterway that runs through downtown, flows northward through the city. There are plans and aspirations to create a creek walk that will connect the Lakefront and Inner Harbor to Franklin Square, Armory Square, The Valley, and ultimately the Onondaga Nation. The creek is navigable, yet can be quite a challenge as its channelized nature speeds up its flow, particularly in the spring, when it may be dangerous. Drownings of youngsters resulted in fencing of the creek through some residential areas. Syracuse has a humid continental climate and is known for its snowfall. Boasting 115.6 inches (294 centimetres) on average, the Syracuse metro area receives more snow on average than any other large city in the United States. Syracuse continually wins the Golden Snowball Award, among Upstate cities. Its record so far is 192.1 inches (488 centimetres). The high snowfall is a result of the fact that the city receives both lake effect from nearby Lake Ontario and nor'easter snow. Snow most often falls in small (about 1–3 inches or 2.5–7.6 centimetres), almost daily doses, over a period of several days. Larger snowfalls do occur occasionally, and even more so in the northern suburbs. One notable blizzard was the Blizzard of 1993, during which 42.9 inches (109 centimetres) fell on the city within 48 hours, with 35.6 inches (90 centimetres) falling within the first 24 hours. Syracuse received more snow than any other city in the country during this storm, which shattered a total of eight local records, including the most snow in a single snowstorm. A second notable snowfall was the Blizzard of 1966, with 42.3 inches (107 cm). The Blizzard of '58 occurred in February (16-17th) across Oswego and Onondaga counties. This storm was an actual blizzard due to the high winds, blowing snow and cold. 26.1 inches (66 cm) of snow was measured at Syracuse N.Y. and drifts reached 20 feet (600 cm) in Oswego County. (See Thirtieth Publication of the Oswego County Historical Society, (1969) and The Climate and Snow Climatology of Oswego N.Y., (1971) February, 1958 was the snowiest month ever in Syracuse, with a record 72.6 inches (184 cm) recorded in 28 days. Syracuse shivered under a white blanket that averaged 4 feet (120 cm) on February 19. Syracuse declared a snow emergency under a new law that allowed municipalities to demand that streets be cleared of vehicles to help with plowing operations. While the average high during summer is around the low 80s, when adding humidity, the apparent temperature highs extend upward in the range of mid-80s to mid-90s in the city. Days just shy of 100 °F (38 °C), such as 96 or 97 °F (36 °C), are not uncommon in and around the city with the humidity factored in. However, days above 100 °F (38 °C) are more rare, even with humidity taken into account. A few recent summers in Syracuse have been warmer than previous ones in the city and, like in some other places in the nation, previous records have been broken. For example, the summers of 2005 and 2002 were, respectively, the hottest and second-hottest summers on record. As of the census of 2000, there were 147,306 people, 59,482 households, and 30,335 families residing in the city. The population density was 5,871.0 people per square mile (2,266.8/km²). There were 68,192 housing units at an average density of 2,717.8/sq mi (1,049.4/km²). The racial makeup of the city was 64.26% White, 25.35% African American, 1.13% Native American, 3.37% Asian, 0.05% Pacific Islander, 2.23% from other races, and 3.61% from two or more races. Hispanic or Latino of any race were 5.27% of the population. The largest ancestries include Irish (15.9%), Italian (14.1%), German (12.2%), English (7.6%), and Polish (5.0%). Non-Hispanic Whites were 52.8% of the population in 2010, down from 87.2% in 1970. There were 59,482 households out of which 30.46% had children under the age of 18 living with them, 12.65% were married couples living together, 14.84% had a female householder with no husband present, and 48.58% were non-families. 38.2% of all households were made up of individuals and 11.9% had someone living alone who was 65 years of age or older. The average household size was 2.29 and the average family size was 3.11. In the city the population was spread out with 25.0% under the age of 18, 16.8% from 18 to 24, 27.9% from 25 to 44, 17.5% from 45 to 64, and 12.9% who were 65 years of age or older. The median age was 30 years. For every 100 females there were 88.9 males. For every 100 females age 18 and over, there were 84.7 males. The median income for a household in the city was $25,000, and the median income for a family was $33,026. Males had a median income of $30,312 versus $23,997 for females. The per capita income for the city was $15,168. About 21.7% of families and 27.3% of the population were below the poverty line, including 35.1% of those under age 18 and 12.4% of those age 65 or over. Syracuse's economy has faced challenges over the past decades as industrial jobs have left the area. The number of local and state government jobs also has been declining for several years. Syracuse's top employers are now primarily in education and the service industry. University Hill is Syracuse's fastest growing neighborhood, fueled by expansions by Syracuse University and Upstate Medical University (a division of the State University of New York), as well as dozens of small medical office complexes. Bristol-Myers Squibb, founded by alumni of nearby Hamilton College, has a complex in East Syracuse. Time Warner Cable has based one of its divisions in Syracuse. Today the Syracuse area has few extremely large employers, but rather many smaller ones, which provides for a certain amount of stability. Additionally, eight of the area's top eleven employers are in education or the service industry, which tend to be much more stable than the manufacturing industry. The Syracuse area's unemployment rate of 5.0 percent is comparable to the national rate of 4.8 (March, 2006). Throughout 2006, the area has continued to gain jobs over the previous year's figures. During February and March 2006, the area's job growth rate tied with New York City for the highest in the state. 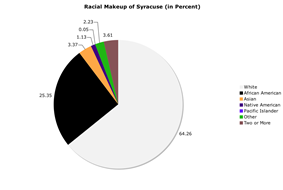 Syracuse's neighborhoods reflect the historically divided population. Traditionally, Irish, Polish and Ukrainian Americans settled on its westside; Jewish Americans on its eastside; German and Italian Americans on the northside; and African-Americans on its southside. Westcott: This neighborhood, located east of University Hill, is inhabited by a wide variety of people, increasingly including some college students as the University grows but still primarily local families and residents. Single-family homes and two-unit apartments comprise the majority of housing. Westcott is known as a bohemian and liberal quarter, and each September hosts the Westcott Street Cultural Fair. The main business district is on Westcott Street between Beech and Dell streets and includes restaurants, bars, an independent bookstore, a consignment shop, and other businesses. Residents are assigned to schools in the Syracuse City School District. 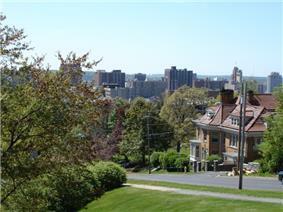 One of Syracuse's major research universities is Syracuse University, located on University Hill. It had an enrollment of 15,097 for the 2013-2014 academic year. Also serving Syracuse are Le Moyne College on the city's eastern border, and Onondaga Community College, which has its main campus in the adjacent Town of Onondaga and has two smaller campuses downtown and in Liverpool. A branch of SUNY's Empire State College is located in downtown Syracuse, along with a campus of the nationwide Bryant & Stratton College. 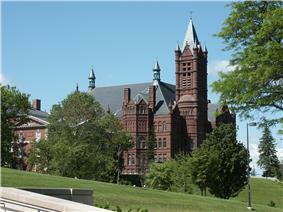 A campus of ITT Technical Institute also calls the Syracuse metropolitan area home, also located in Liverpool. There are also the Crouse Hospital College of Nursing and St. Joseph's College of Nursing. Other colleges and universities in the area include Cornell University and Ithaca College in Ithaca, Hamilton College in Clinton, Oswego State University in Oswego, SUNY Cortland in Cortland, Morrisville State College in Morrisville, Colgate University in Hamilton, Cazenovia College in Cazenovia, Wells College in Aurora, and both Utica College and SUNY Institute of Technology in Utica. Onondaga County Public Library operates Syracuse's public libraries. An up-to-date directory and events calendar covering all of the visual and performing arts in Syracuse is available at SyracuseArts.net. Live jazz music is the centerpiece of two annual outdoor festivals in Syracuse, the M&T Syracuse Jazz Festival, Polish Festival as well as the CNY Jazz Arts Foundation's Jazz In The Square Festival. Performers in the last five years have included Chuck Mangione, Joshua Redman, Smokey Robinson, Branford Marsalis, The Bad Plus, Randy Brecker, Stanley Clarke, Jimmy Heath, Terrence Blanchard, Slide Hampton, Bobby Watson, Dr. John, and Aretha Franklin. The Polish Festival hosted Grammy winners Jimmy Sturr and his Orchestra, Polish music legend Stan Borys and Irena Jarocka, Grammy nominee Lenny Goumulka, LynnMarie, Dennis Polisky & The Maestro's Men, Jerry Darlak and the Buffalo Touch & The John Gora Band. Syracuse is home to the 75-member Syracuse Symphony Orchestra (SSO), founded in 1961. The SSO is under direction of Daniel Hege; its former Music Directors include Frederik Prausnitz and Kazuyoshi Akiyama. The orchestra performs over 200 concerts annually for an audience of over 250,000. The Clinton String Quartet has been active for over 15 years and is based in the Syracuse area. All four members are also members of the Syracuse Symphony Orchestra. The upstate New York. The Society commissions at least one new work each year from a regional composer, awards the annual Brian Israel Prize to a promising composer under 30 years of age, and produces the weekly "Fresh Ink" radio broadcast for WCNY-FM. The Syracuse Opera Company is a professional company that generally performs three operas each season. It was founded in 1963 as the Opera Chorus of the Syracuse Symphony Orchestra and became independent in 1973. In addition to full performances, it offers several free outdoor concerts each year in Armory Square, Thornden Park, and elsewhere. The company has an annual budget of $1 million and is the only professional opera company in upstate New York. Syracuse Stage presents experimental and creative theater; a number of its productions have been world premieres and have moved to Broadway. The venue was designed by its most famous former artistic director Arthur Storch. Its current artistic director is Timothy Bond. Milton J. Rubenstein Museum of Science and Technology is a museum located in the Armory Square neighborhood that features exhibits in science and technology and also houses the city's only IMAX theater. Delavan Art Gallery is located at 501 West Fayette Street in an old farm equipment factory. It has a 3,800 square feet (350 m2) of exhibit space, and, on several other floors in the building, houses the studios of a number of area artists. It has shows which usually open on the first Thursday of the month. 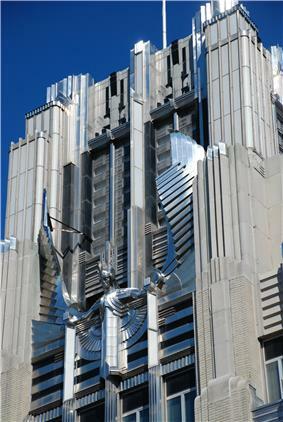 It showcases a wide variety of work, from multi-media sculpture to hyperrealism. The City of Syracuse maintains over 170 parks, fields, and recreation areas, totaling over 1,000 acres (4.0 km2). Burnet Park includes the first public golf course in the United States (1901) and Rosamond Gifford Zoo. 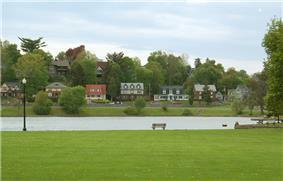 Other major parks include Thornden Park, Schiller Park, Sunnycrest Park, and the joined Onondaga and Kirk Parks. There are 12 public pools, two public ice rinks, and two public nine-hole golf courses in the city. Right outside the city proper, along the east side and north end of Onondaga Lake, is Onondaga Lake Park. The adjacent Onondaga Lake Parkway is closed to vehicular traffic several hours on Sundays during the summer months, so it can be used for walking, running, biking, and rollerblading. During the holiday season, the park hosts Lights on the Lake, a two-mile (3 km) drive-through light show. Syracuse is served by the Central New York Regional Transportation Authority, or CNYRTA. The CNYRTA operates bus service in Syracuse and its suburbs, as well as to outlying metropolitan area cities such as Auburn, Fulton, and Oswego. The Pyramid Companies have also proposed a monorail linking Syracuse University to Hancock International Airport, via downtown, (Downtown Syracuse), their proposed Destiny Resort, the William F. Walsh Regional Transportation Center, and their proposed Destiny Technology Park. The cost of such a line has been estimated at $750 million. The city lies on Amtrak's Empire Service, Lake Shore Limited, and Maple Leaf lines. The Lake Shore Limited connects Syracuse to the same cities as above (except Niagara Falls), but continues westward from Buffalo to Chicago via Cleveland and Toledo, and eastward to Boston. This train completes one roundtrip daily. Also completing one roundtrip a day, the Maple Leaf follows the path of the Empire Service train, but continues to Toronto. Amtrak's station is part of the William F. Walsh Regional Transportation Center. Syracuse is served by the Syracuse Hancock International Airport in nearby Salina, near Mattydale. The airport is served by 6 major airlines, which provide non-stop flights to destinations as far away as Minneapolis, as well as several daily flights to other important airline hubs and business centers such as Atlanta, Boston, Charlotte, Chicago, Detroit, Minneapolis, New York City, Philadelphia, Tampa, Washington, DC, Toronto, and 147 foreign cites from 87 different countries, not including USA . Cargo carriers FedEx and UPS also serve the airport. New York City can be reached in under an hour flight. Interstate 81 (Highway 401 via Highway 137 in Ontario to Knoxville) runs north-south through Syracuse, and provides access to Canada, Pennsylvania and points south. Its downtown portion is extremely narrow, only consisting of four lanes and essentially no onramps. It forms a physical and psychological border between downtown and University Hill, an issue both Syracuse University and local politicians are trying to address. Moreover, it essentially marks the boundary between two State Senate districts. 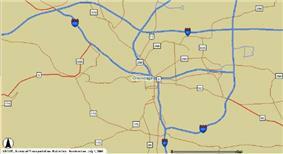 Interstate 90 (Seattle to Boston), also known as the New York State Thruway runs east-west, just north of the city. It is a toll highway that provides access to Rochester, Buffalo, Albany, and the north-south (Interstate 87) part of the Thruway which leads to New York City. Interstate 690 runs east-west through the city, and provides access to Interstate 90, as well as to Syracuse's northwestern and eastern suburbs. A spur off I-690 directly west of the city, NY 695, provides freeway access to the southwestern suburbs. 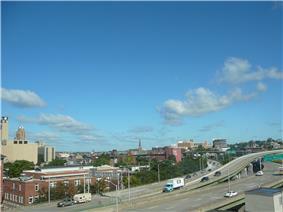 It meets Interstate 81 in downtown Syracuse in a highly complex and incomplete intersection. Most of its routing through the city directly replaced elevated rail lines, a fact quite notable by the city's former main rail terminal, where the freeway spans the width between the terminal and its outermost platform. In 1981 artist Duke Epolito erected sculptures of "passengers" on the far platform. The piece is entitled "Waiting for a Night Train." The city is headed by an elected Department of Housing and Urban Development. After serving the remaining term, Driscoll was re-elected that year, and again in 2005. Driscoll is a member of the Mayors Against Illegal Guns Coalition, a bi-partisan group with a stated goal of "making the public safer by getting illegal guns off the streets." The Coalition is co-chaired by Boston Mayor Thomas Menino and New York City Mayor Michael Bloomberg. On November 3, 2009, Common Councilor At Large Stephanie Miner was elected Mayor. Before the merger with the evening paper, the Post-Standard was named among the "10 best newspapers in America with a circulation of under 100,000" by Canadian to the Pennsylvanian border. The newspaper partly caters to this audience as well, covering many stories from the Ithaca, Utica, and Watertown areas. Since opening a new printing press in 2002, the paper calls itself "America's Most Colorful Newspaper," as almost every page contains color. Syracuse New Times is a weekly, free, ad-supported arts and entertainment newspaper. Owned by Zimmer Ltd, Syracuse New Times is published in Syracuse, New York by Arthur Zimmer and distributed throughout the central New York region. The publication is released every Wednesday, with over 137,600 readers, and is distributed to over 950 locations in Central New York. Launched in 1969, it is one of the oldest alternative weekly newspapers in the country. There are other popular free newspapers, including Eagle Newspaper's downtown edition, the City Eagle, and Table Hopping, which focuses on the restaurant and entertainment scene. Syracuse University's student-run TV station is CitrusTV. CitrusTV programming is broadcast on the university campus on the Orange Television Network. The station also provides content to Time Warner Cable Sports. Online, CitrusTV programs can be found on CitrusTV.net and the Post-Standard's Syracuse.com. Syracuse's cable television provider is Time Warner Cable, which, as a part of its regular and digital offerings, provides a 24-hour local news channel (YNN), local sports channel, public access channel, and an additional PBS channel. Buddhism: Buddhism has its presence in Syracuse with the Zen Center of Syracuse on the Seneca Turnpike; as well as a center on Park Street, on the city's north side. Sikhism: Sikh The house of worship is the Sikh Foundation of Syracuse, in Liverpool. Islam: Islam also has a presence in Syracuse, with the Islamic Society of Central New York Mosque on Comstock Avenue and Muhammad's Study Group on West Kennedy Street. Judaism: There are several synagogues in the Syracuse metropolitan area, including Beth Shalom-Chevra Chas, Temple Adath Yeshurun, and the Temple Society of Concord, which is considered to be the ninth oldest Jewish House of Worship in the United States. Unitarian Universalism: There are two Unitarian Universalist Societies in Syracuse including May Memorial Unitarian Society and First Unitarian Universalist Society of Syracuse. 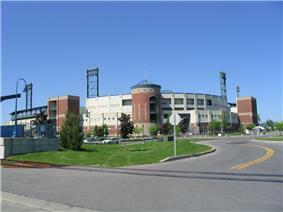 NBT Bank Stadium is home to the Syracuse Chiefs Triple A Baseball team. It was built in 1997 on the city's northside. 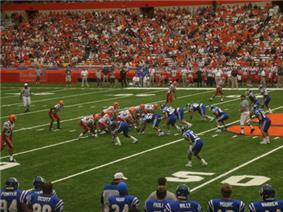 Syracuse University's football team is part of the ACC Conference and plays its games in the Carrier Dome. Mark Levinson - producer of "Mystic Pizza" and "Home Alone". ^ "NCDC: U.S. Climate Normals". 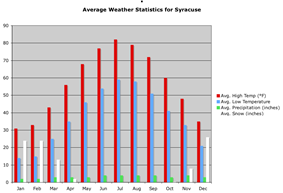 ^ "Monthly Averages for Syracuse Hancock International Airport". ^ "Syracuse (city), New York". State & County QuickFacts. U.S. Census Bureau. Retrieved April 20, 2012. ^ Moriarty, Rick (2006-09-26). "High flying idea stuck". ^ "Graphic of commuter traffic volume". Syracuse Central. ^ "City of Syracuse". Retrieved 2009-11-04. ^ "Mayors Against Illegal Guns: Coalition Members". 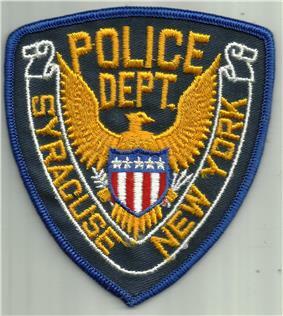 ^ "Chief of Police at Syracuse Police Department". ^ The previous list of Syracusans was filtered to only include those with over a million Google hits for their name plus their profession.